I’ve already touted the magical deliciousness that a broken sole offers in the previous Reader Question of the Day post dated July 18, 2010. Taking into consideration one of the comments regarding the somewhat pricey Elie Tahari Janine Driver, I felt I owed you a more affordable option. So I spent my last trip to the local shoe shops keeping that in mind. I was strolling through The Gap, when out of the corner of my eye, I saw a corner display full of the elasticized ballet flats. 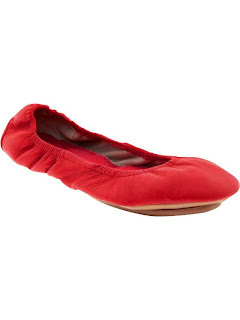 I personally have reservations about elasticized flats because for some reason, my ankles tend to be shredded by these. In fact, I had to give up two pairs of some adorable Seychelles because of that. So, always willing to try everything once, I tried these puppies on. The leather was that extremely supple kind and the soles were broken. Granted these are only broken into two parts - the sole and the heel - but for $39.50, you can’t be *too* demanding. Admiring the softness and “ridiculously comfortable” fit of the shoe, I realized these shoes actually come in their own little drawstring baggie – BONUS! They fold in half and fit neatly in this little matching 6” bag that would tuck nicely into any tote, handbag, or even your desk drawer at work. I can see these being a great shoe change for when you don’t want to wear out your treasured designer lovelies on the hard city sidewalks, when your feet just can’t take your lovelies from a long marathon day, or even when you’re just needing some serious TLC for your tootsies. They come in 5 great colors: the palest ballet pink, basic black, fire engine red, purple rain, and burgundy laselle red.